FODM's newsletter,The Marsh Wren received an Excellence in Craft Award as the Best Virginia Newsletter from the Virginia Outdoor Writers Association at the group's annual meeting in February, 2014. 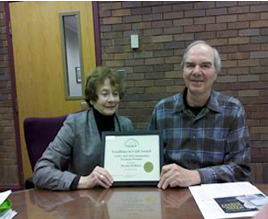 Congratulations to Dorothy McManus, Editor, and Duncan Hobart, Assistant Editor pictured below with the award. The Marsh Wren is the quarterly newsletter published by the Friends of Dyke Marsh. It provides the latest news on what is happening in Dyke Marsh, announcements of upcoming events and activities and other information of interest to members of FODM. In the table below, click on the issue date to open the newsletter in PDF format.